The role of EEG, and in particular the focus on focal abnormalities, has evolved over time. In the past, the identification of focal EEG abnormalities often played a key role in the diagnosis of superficial cerebral mass lesions. For example, if the EEG of a comatose patient revealed decreased amplitude over 1 cerebral hemisphere, subdural hematoma was strongly suspected. Today, with the availability and routine use of detailed imaging techniques such as CT and MRI, the EEG no longer plays this role, although it still has a central place in the diagnosis and management of patients with seizures, epilepsy, and altered mental status. While the indications for EEG have evolved, the EEGs recorded today still exhibit the same variety of focal abnormalities as in the past and a framework for analyzing these abnormalities is still necessary to interpret and articulate the clinical implications of a recording. Focal EEG abnormalities may be categorized as epileptiform or nonepileptiform. 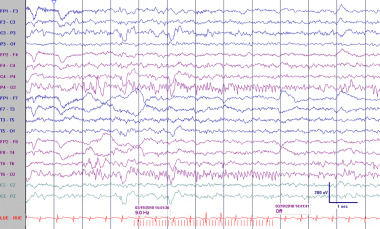 Epileptiform transients such as spikes and sharp waves are the interictal marker of a patient with epilepsy and are the EEG signature of a seizure focus. Nonepileptiform abnormalities are characterized by alterations in normal rhythms or by the appearance of abnormal ones. While these 2 types of nonepileptiform abnormalities often coexist, especially when clinically significant, distinguishing them is conceptually useful and aids in their recognition and description. Nonepileptiform EEG abnormalities are associated with focal cerebral dysfunction, often due to a demonstrable structural lesion. By contrast, more widespread central nervous system (CNS) derangements, such as those due to metabolic disturbances, usually produce generalized EEG abnormalities. On occasion, widespread CNS derangements do result in the appearance of focal EEG abnormalities; this often occurs in patients with preexisting structural abnormalities. The discussion that follows assumes familiarity with the normal EEG. 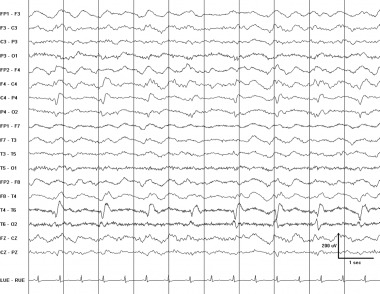 For an excellent introduction, see Normal EEG Waveforms. Widespread asymmetries in the amplitude of background activities, when not accompanied by other abnormalities, should be interpreted with caution because they can occur in healthy patients. Relatively focal asymmetries are more often associated with significant pathology. Focal abnormalities in beta activities are often most easily appreciated in patients taking benzodiazepines or other medications that increase the amount of beta in the background. The most common cause of focal enhancement of beta activities is the breach rhythm. This occurs in the setting of a skull defect, most commonly due to a craniotomy or burr hole. The amplitudes of other frequency components of the background are increased as well, but to lesser extent. A common pitfall in EEG interpretation is to classify the sharply contoured background evident in the region of a skull defect as epileptiform. While the enhancement of beta activities is maximal near the margins of the skull defect, breach rhythms are usually widespread and are often maximal over the central regions, where the mu rhythm can be greatly accentuated. Focal enhancement of beta activities in the absence of a skull defect is encountered rarely. While this can be seen with focal cortical dysplasias,  tumors, stroke, and vascular malformations, focal attenuation of beta activities is more common in all of these conditions. Focal attenuation of faster activities is a hallmark of a lesion involving the cerebral cortex. Attenuation of faster activities can also be caused by an intervening fluid collection in the subgaleal, epidural, or subdural spaces. Extra-axial fluid collections alone do not cause abnormal slow waves; their presence is indicative of parenchyma involvement. Differences in the amplitude of the PDR alone are rarely significant. Asymmetries in the extent of the field of the PDR also occur in healthy patients. Similarly, asymmetries in the amplitude of the response to photic stimulation alone are not reliable indicators of pathology. Asymmetries in frequency and regulation of the PDR are much more suggestive of a focal lesion. While the causative lesion may be at some distance from the occipital pole, the lesion is usually ipsilateral to the abnormal PDR. This EEG abnormality can occasionally be falsely lateralizing; this can occur in patients in whom the dominant generator of the PDR involves the medial surface of the cerebral hemisphere and projects contralaterally. Rarely, epileptogenic lesions react to photic stimulation by producing large-amplitude driving responses or spikes ipsilateral to the lesion. Bancaud phenomenon is an uncommon finding in which there is unilateral failure of the PDR to attenuate with eye opening. This is typically associated with ipsilateral posterior subcortical lesions. See the images below. Abnormal asymmetric photic driving in a 4-year-old boy with seizures. While lesser degrees of amplitude asymmetry in photic driving are not reliable indicators of pathology, in this case the amplitude difference is at least 5-fold. The photic driving response is usually attenuated on the abnormal side. Here, the preponderance of the slowing over the right posterior head regions with the eyes open, along with the probable spikes in the same area, suggest that the affected side may be the right. In addition, the abnormality occurs in the presence of scanning eye movements (note the horizontal eye movements just before, during, and after photic stimulation), which would often attenuate the driving response. Patient is a 4-year-old boy with seizures. Photic stimulation at a higher frequency provokes spikes with a widespread field with the principal phase-reversal at 02. Like differences the PDR, amplitude asymmetries of the mu rhythm alone are rarely associated with focal pathology. The mu rhythm is unilateral in about 30% of healthy patients, at least in the routine EEG. A change in the frequency or rhythmicity of the mu or the intrusion of slower activities is a reliable indicator of ipsilateral pathology. Prolonged and asynchronous sleep spindles are a normal finding before the age of 2 years. In older individuals, prolonged and large amplitude sleep spindles are usually caused by medications, frequently benzodiazepines. Asynchronous sleep spindles beyond the age of 2 years are abnormal. Bilaterally prolonged spindles have been associated with mental retardation. The unilateral absence, decreased amplitude, or frequency of sleep spindles at any age is abnormal and is associated with ipsilateral lesions. The lesion may be anywhere along the thalamocortical axis. Asymmetric vertex waves similarly suggest a lesion on the side of the depressed amplitude. See the image below. Asymmetric sleep spindles. 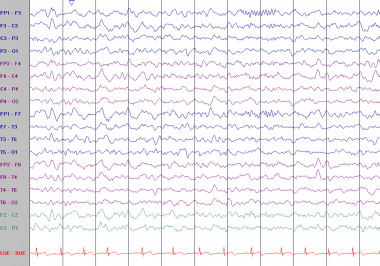 This EEG is from a 12-year-old boy with seizures. The frontally displaced 12-Hz sleep spindles are attenuated on the right. Frontally displaced spindles are a normal variant. They are often slightly slower than, and coexist with, centrally predominant spindles. However, the asymmetry of the spindles is an abnormality and could be a consequence of a structural lesion on the right. Abnormal slow rhythms are characterized as focal or generalized, rhythmic (monomorphic) or polymorphic (arrhythmic), intermittent or continuous, and in terms of the dominant frequency (delta or theta). The most commonly encountered types of abnormal slow rhythms are discussed below. These activities consist of arrhythmic slow waves that vary in frequency, amplitude, and morphology. Polymorphic slowing on the basis of a structural lesion requires involvement of white matter. Lesions involving the cortex alone do not cause polymorphic slowing; these lesions are typically associated with focal attenuation of normal rhythms. Continuous polymorphic delta slowing (CPD) is highly, but not inevitably, correlated with structural lesions. In studies that rely on CT, a structural lesion was present in about two thirds of adult patients with CPD. [4, 5] Seizures occur in more than 50% of cases of CPD in which no structural lesion is present. In these series, transient ischemic attack was the next most common cause of CPD. CPD that resolves with prolonged recording or on subsequent routine EEGs often is a postictal effect, analogous to a Todd paresis. This phenomenon can be highly lateralizing. Other causes of CPD include migraine and trauma. Like postictal CPD, the slowing in these settings would be expected to resolve on subsequent EEGs. When focal slowing is intermittent, involves substantial theta, or disappears with eye opening or in sleep, a structural lesion is less likely. When CPD is due to a structural lesion, the EEG is usually not helpful in determining its etiology. Ischemic stroke, hemorrhage, and tumors can all cause overlapping and occasionally indistinguishable EEG findings. Rapidly changing intraparenchymal lesions, such as acute strokes and high-grade gliomas, are more likely to produce profound EEG changes. Slowly changing extra-axial lesions such as meningiomas tend to produce relatively subtle changes in the EEG. The EEG can usually lateralize the lesion, although at times the slowing produced by parasagittal lesions can project to the contralateral hemisphere and frontal lesions often produce bilateral abnormalities. In the latter case, the polymorphic slowing is typically of larger amplitude and has a wider field on the side of the lesion. There is often significant discordance between the localization of the polymorphic slowing and the corresponding lesion. In particular, frontal and parietal lesions often produce delta activity that is of highest amplitude and phase-reverses over the temporal regions. A small amount of focal polymorphic slowing involving the temporal regions is frequently seen in elderly subjects. Norms are difficult to establish. This finding has been argued to correlate with cerebrovascular disease. When the slowing is encountered rarely in the record, incorporates significant theta rather than delta, and is restricted to drowsiness, it is often not of clinical significance. See the image below. Continuous polymorphic delta. This EEG is from a 23-year-old woman who suffered a right middle cerebral artery stroke. She had a history of rheumatic fever and mitral valve replacement. There is continuous polymorphic delta slowing over the left temporal lobe. Faster activities are attenuated in the same region. Note the irregularly irregular heart rate, consistent with atrial fibrillation. Frontal intermittent rhythmic delta activity (FIRDA) and generalized intermittent rhythmic delta activity (GIRDA) are usually associated with global cerebral dysfunction due to metabolic disarray. A small amount of FIRDA, especially when it is restricted to drowsiness, can be a normal finding in elderly subjects. FIRDA is rarely due to a subcortical lesion or elevated intracranial pressure. When frontal rhythmic activities have a triphasic morphology, the complexes are referred to as triphasic waves. Unlike the case with FIRDA, there is often an interval between consecutive waveforms of this type. These discharges often have an anterior-posterior phase gradient. Triphasic waves typically occur in the setting of more profound metabolic disarray than FIRDA. They are classically associated with hepatic encephalopathy, although they are neither a sensitive nor specific sign of this entity. Occipital intermittent rhythmic delta activity (OIRDA) is encountered most often in pediatric patients. Like FIRDA, OIRDA can be a consequence of diffuse cerebral dysfunction and rarely a sign of increased intracranial pressure. It often occurs in children with absence epilepsy. Temporal intermittent rhythmic theta activity, when not accompanied by polymorphic slowing, is usually not pathological. It is most often encountered in drowsiness, where the wave-forms typically phase-reverse over the mid temporal regions. These sequences are referred to, not surprisingly, as rhythmic mid temporal theta bursts of drowsiness (RMTD) as well as psychomotor variant. At times, these discharges can have a notched appearance, resembling focal spike-and-wave. While these sequences can be alarming, RMTD is not an ictal pattern and is not associated with epilepsy. Temporal intermittent rhythmic delta activity (TIRDA) is both less common than and more specific for temporal lobe epilepsy than temporal polymorphic delta. It occurs in fewer than 1% of EEGs done for clinical indications but, in one study, in 28% of patients with temporal lobe epilepsy. See the images below. Frontally predominant intermittent rhythmic delta activity (FIRDA) in a 53-year-old woman with a metabolic encephalopathy. Triphasic waves in a 61-year-old man with uremia. Each of the 3 phases of these frontally predominant waves is longer in duration than the preceding phase. The second phase is positive in polarity and has the greatest amplitude. There is a suggestion of the anterior to posterior phase delay that is often associated with triphasic waves. While this very rarely represents an ictal pattern, the possibility of seizures would have to be entertained if the clinical scenario was strongly suggestive, that is, if a similar pattern was recorded from a metabolically intact adolescent with waxing and waning confusion. Rhythmic mid temporal theta bursts of drowsiness (RMTD). 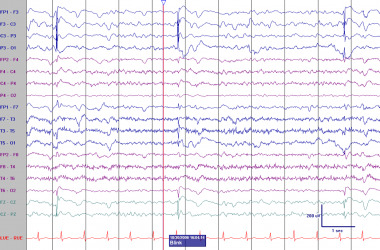 The EEG was recorded from a drowsy 9-year-old boy with seizures. These monomorphic waves occur bilaterally but with greater amplitude on the right. RMTD might be mistaken for pathological intermittent rhythmic slowing or an ictal pattern. Unlike an ictal pattern, these discharges do not evolve in frequency or distribution. Focal interictal epileptiform discharges (IEDs) are sharply contoured transients that are distinct from and usually interrupt background activities. IEDs are almost always of negative polarity at the scalp surface. IEDs usually occur sporadically. When they occur periodically or nearly so, they are referred to as pseudoperiodic epileptic discharges. IEDs are discussed in detail in Epileptiform Discharges. Some of their clinical implications are briefly reviewed here. Sporadic IEDs are categorized as spikes or sharpwaves. By convention, a spike is defined as an IED of less than 70 milliseconds in duration and a sharp wave as an IED of 70-200 milliseconds in duration. The distinction between these 2 patterns has no etiologic or prognostic significance. In clinical discussions the terms are often used interchangeably. 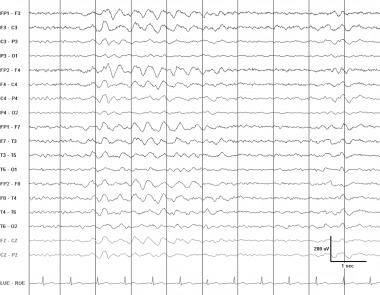 In a patient in whom there is some doubt as to whether a paroxysmal event represented an epileptic seizure, the presence of spikes or sharp waves on a routine EEG often resolves the question. Because spikes and sharp waves occur rarely in the general population—the incidence is about 1% in healthy adults and 3% in healthy children and somewhat higher in hospitalized patients—when an EEG is performed in a patient in whom there is reasonably high suspicion that the patient had a seizure, the predictive value of IEDs is high. The presence of IEDs in a routine EEG also can yield significant prognostic information that can be important when making decisions about instituting antiepileptic therapy. In patients examined after a first seizure, the presence of IEDs is associated with an approximately 2-fold increased likelihood of seizure recurrence. Generalized epileptiform discharges tend to be more predictive of seizure recurrence than focal IEDs. Important caveats are as follows. Most blind patients with rare occipital spikes do not have seizures. When the general population is screened, the presence of IEDs characteristic of the idiopathic or primary epilepsy syndromes frequently occur in patients who do not have seizures. Seizures in BECTS are usually nocturnal, typically characterized by drooling and rhythmic contraction of 1 side of the face and arm and may secondarily generalize. The presence of the typical discharge secures the diagnosis. If a patient has a substantially different seizure type, the possibility that the discharges are an incidental finding must be carefully considered, along with the possibility that the patient suffers from a localization-related epilepsy with an electroclinical signature that mimics BECTS. While the presence of IEDs in a routine EEG is often helpful in clinical decision making, the converse is not necessarily the case. 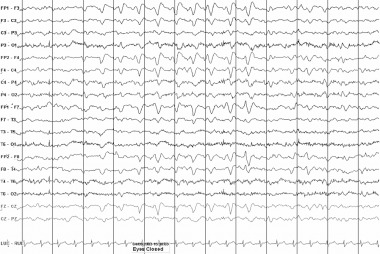 The absence of IEDs in a routine EEG certainly does not prove that a paroxysmal event was not a seizure or that a patient does not have epilepsy. Routine EEGs are normal in about 50% of patients with a clinical diagnosis of seizures, although the yield improves with multiple or more prolonged EEGs. As a limiting case, in 2 series of patients studied in epilepsy monitoring units, IEDs were never identified in 4-19% of those in whom epileptic seizures were recorded. [10, 11] In patients with partial epilepsy, this is more likely to occur with extratemporal foci. The absence of IEDs in patients with generalized onset seizures is exceptional in children and unusual in adults. In patients with established seizures, IEDs often shed light on the underlying epilepsy syndrome. For example, in a neurologically normal adolescent patient with normal imaging who presents with a history of convulsions, whether the patient has a generalized or localization-related seizure disorder may be uncertain. The presence of 3-Hz generalized spike-wave abnormalities on EEG would suggest a primary generalized seizure disorder. 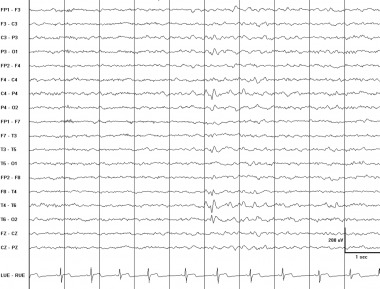 By contrast, a normal EEG or one with nonepileptic abnormalities would be more consistent with a localization-related epilepsy syndrome and the presence of temporal spikes would suggest the diagnosis of temporal lobe epilepsy. Left anterior temporal spike. 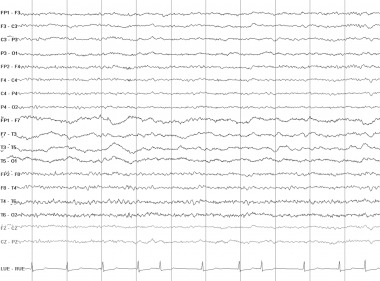 This EEG was recorded in the drowsy state (note the absence of a posterior dominant rhythm and the presence of slow horizontal roving eye movements). The patient was a 53-year-old man with a history of monthly episodes of behavioral arrest and automatic behavior consistent with complex partial seizures arising from the temporal lobe. Right posterior temporal spike. 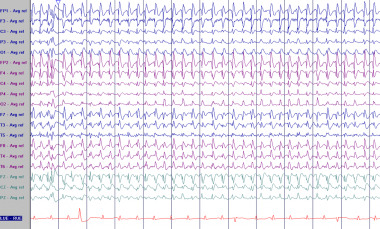 This EEG is from a 15-year-old boy with a history of complex partial seizures. The spike phase reverses at T6. The field of the discharge extends into the parietal and occipital regions. 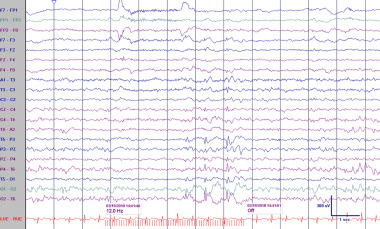 An EEG typical of the syndrome of benign childhood epilepsy with centrotemporal spikes (BECTS). 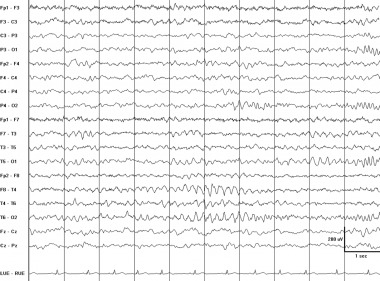 This EEG was recorded from an otherwise neurologically normal 9-year-old boy with nocturnal seizures that consisted of drooling and clonic contractions of 1 side of the face and arm. There are frequent right-sided central mid temporal spikes. These stereotyped discharges exhibit a positive phase-reversal over the frontal region (asterisks). A longitudinally oriented horizontal dipole is frequently seen in patients with BECTS, although it is not specific for this syndrome. Pseudoperiodic lateralized epileptiform discharges (PLEDs) are EEG abnormalities consisting of repetitive spike or sharp wave discharges that are focal or lateralized over 1 hemisphere, recur at intervals of 0.5-5 seconds, and continue through most of a routine EEG study. They are seen most frequently in the setting of acute unilateral lesions such as cerebral infarctions, encephalitis, or tumors. In 1 study, almost 50% of patients with PLEDs had acute lesions, approximately 45% had chronic lesions, and the remainder had normal imaging. When PLEDS occur in a patient with epilepsy, they often represent a postictal pattern. When PLEDs occur in patients with chronic lesions, significant metabolic derangement is often present. PLEDs are usually self-limited and resolve after the acute phase of a cerebral insult. Rarely, they may persist on a chronic basis. 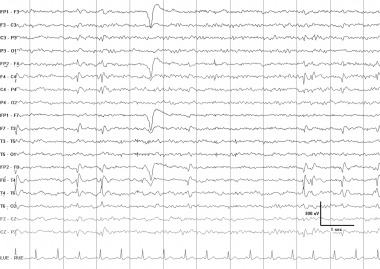 Seizures often occur acutely in patients with PLEDS discovered on a routine EEG (the incidence may 50% or more [13, 14] ) but the electrographic seizure pattern is usually distinct from the PLEDs. Certain neurologic presentations, such as epilepsia partialis continua or transient confusional states, can be associated with PLEDs. When they have a clear-cut clinical correlate, PLEDs constitute an ictal pattern. Bilateral independent PLEDs (BiPLEDs) are periodic complexes occurring asynchronously over both hemispheres. BiPLEDS may differ in morphology and site of maximal expression on each side. This is an uncommon EEG finding. In a series of 18 patients, the most common causes were anoxic brain injury (28%) and CNS infection (28%). While BiPLEDs have been associated with herpes simplex encephalitis, the pattern can occur in other CNS infections as well. In this series, the clinical correlates of BiPLEDs differed somewhat from those of PLEDs. The incidence of coma is higher in BiPLEDs than in PLEDs (72% vs 24%) and the mortality rate is higher (61% vs 29%). The incidences of focal seizures, focal neurologic deficits, and focal imaging abnormalities are lower. When pseudoperiodic discharges occur synchronously over both hemispheres, they are termed generalized or bilateral pseudoperiodic discharges (GPEDs or BiPEDs). GPEDs most often occur in the setting of anoxia where they suggest a poor prognosis. They are also associated with stroke, profound metabolic disturbance, intoxication, and Creutzfeldt-Jacob disease. When they occur at a low frequency (at intervals of about 0.25 Hz or less) and involve more prolonged and often stereotyped polyphasic discharges, diagnostic considerations include SSPE and intoxication with PCP and ketamine. When the complexes occur at low frequency at relatively low amplitudes against a voltage-depressed background, the pattern is termed burst suppression and is seen most often in anoxia and in the presence of general anesthetics. Pseudoperiodic lateralized epileptiform discharges (PLEDS) in a 45-year-old woman after a stroke. These sharply contoured waveforms phase-reverse over the right posterior temporal region. Their fields involve much of the right hemisphere. PLEDs in an elderly patient with an acute right middle cerebral artery infarction. These 0.5- to 1-Hz discharges with superimposed sharply contoured beta activities are more ictal-appearing than those seen in the previous example. Is this a seizure? See next image. PLEDs in an elderly patient with an acute right middle cerebral artery infarction. In the sixth second the interictal PLEDs are replaced by a clearcut evolving seizure pattern. Ictal PLEDs. This patient underwent an elective left-sided evacuation of a subdural hematoma some months before this EEG was recorded. This study was done to evaluate right-sided myoclonic jerks and aphasia in the setting of a urinary tract infection. The myoclonic jerks were time-locked to the left-sided PLEDs in previous image. These discharges, the myoclonic jerks, and the aphasia all resolved after treatment with antibiotics and valproate. Because these discharges were associated with a reversible neurologic deficit and time-locked to a focal movement, they were classified as an ictal pattern. Pseudoperiodic generalized epileptiform discharges (GPEDs) in a 67-year-old patient after cardiac arrest. Some authors would refer to these discharges as bilateral pseudoperiodic epileptiform discharges (BiPEDs). These GPEDS were recorded in a 17-year-old with subacute sclerosing panencephalitis (SSPE). The patient presented with a slowly progressive encephalopathy and myoclonic jerks when awake. When GPEDs are present in SSPE, they typically repeat at a relatively low frequency and have a complex morphology. During a single recording, the morphology and repetition rate of the discharges are often strikingly stereotyped. When myoclonic jerks are present, they are time-locked to the periodic discharges. A burst-suppression pattern, a species of GPEDs, recorded after prolonged cardiac arrest. Mixed frequency, low-amplitude bursts of variable morphology are separated by periods of profound background attenuation. What are focal EEG waveform abnormalities? What is the significance of asymmetries of faster activities on focal EEG? What are focal EEG waveform abnormalities of the posterior dominant rhythm (PDR)? What are focal EEG asymmetries of the mu rhythm? What are focal EEG asymmetries of sleep architecture? How are abnormal slow rhythms characterized on EEG? What is focal polymorphic delta slowing on EEG? What is rhythmic slowing on EEG? What are focal interictal epileptiform discharges (IEDs) on EEG? How are sporadic focal interictal epileptiform discharges (IEDs) characterized on EEG? What are important caveats in interpreting focal interictal epileptiform discharges (IEDs) on EEG? What are pseudoperiodic epileptiform discharges on EEG? Fahoum F, Lopes R, Pittau F, Dubeau F, Gotman J. Widespread epileptic networks in focal epilepsies: EEG-fMRI study. Epilepsia. 2012 Sep. 53(9):1618-27. [Medline]. Tedrus GM, Fonseca LC, Nogueira Junior E, Pazetto D. Epilepsy with onset at over 50 years of age: clinical and electroencephalographic characteristics. Arq Neuropsiquiatr. 2012 Oct. 70(10):780-5. [Medline]. Varotto G, Tassi L, Franceschetti S, Spreafico R, Panzica F. Epileptogenic networks of type II focal cortical dysplasia: a stereo-EEG study. Neuroimage. 2012 Jul 2. 61(3):591-8. [Medline]. Gilmore PC, Brenner RP. Correlation of EEG, computerized tomography, and clinical findings. Study of 100 patients with focal delta activity. Arch Neurol. 1981 Jun. 38(6):371-2. [Medline]. Marshall DW, Brey RL, Morse MW. Focal and/or lateralized polymorphic delta activity. Association with either 'normal' or 'nonfocal' computed tomographic scans. Arch Neurol. 1988 Jan. 45(1):33-5. [Medline]. Geyer JD, Bilir E, Faught RE, Kuzniecky R, Gilliam F. Significance of interictal temporal lobe delta activity for localization of the primary epileptogenic region. Neurology. 1999 Jan 1. 52(1):202-5. [Medline]. Berg AT, Shinnar S. risk of seizure recurrence following a first unprovoked seizure: a quantitative review. Neurology. 1991. 41:965-72. [Medline]. Kellaway P. The incidence, significance and natural history of spike foci in children. Henry CE. Current clinical neurophysiology: update on EEG and evoked potentials. Amsterdam: Elsevier; 1981. 151-175. 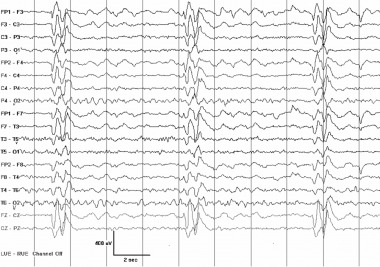 Benbadis SR, Lin K. Errors in EEG interpretation and misdiagnosis of epilepsy. Which EEG patterns are overread?. Eur Neurol. 2008. 59:267-71. [Medline]. Walczak TS, Scheuer ML, Resor S, et al. Prevalence and features of epilepsy without interictal epileptiform discharges. [Abstract]. Neurology. 1993. 43(Suppl 2):287-8. Stüve O, Dodrill CB, Holmes MD, Miller JW. 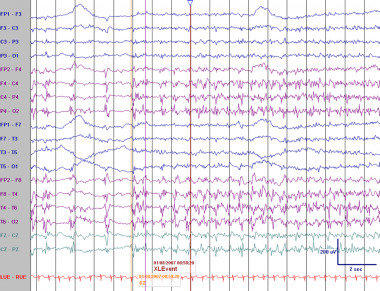 The absence of interictal spikes with documented seizures suggests extratemporal epilepsy. Epilepsia. 2001 Jun. 42(6):778-81. [Medline]. Kalamangalam GP, Diehl B, Burgess RC. Neuroimaging and neurophysiology of periodic lateralized epileptiform discharges: observations and hypotheses. Epilepsia. 2007 Jul. 48(7):1396-405. [Medline]. García-Morales I, García MT, Galán-Dávila L, Gómez-Escalonilla C, Saiz-Díaz R, Martínez-Salio A. Periodic lateralized epileptiform discharges: etiology, clinical aspects, seizures, and evolution in 130 patients. J Clin Neurophysiol. 2002 Apr. 19(2):172-7. [Medline]. Pohlmann-Eden B, Hoch DB, Cochius JI, Chiappa KH. Periodic lateralized epileptiform discharges--a critical review. J Clin Neurophysiol. 1996 Nov. 13(6):519-30. [Medline]. de la Paz D, Brenner RP. Bilateral independent periodic lateralized epileptiform discharges. Clinical significance. Arch Neurol. 1981 Nov. 38(11):713-5. [Medline]. Bazil CW, Herman ST, Pedley TA. Focal Electroencephalographic Abnormalities. Ebersole JS, Pedley TA. Current Practice of Clinical Electroencephalography. 3rd ed. Philadelphia: Lippincott Williams & Wilkins; 2003. 303-347. Brenner RP. The interpretation of the EEG in stupor and coma. Neurologist. 2005 Sep. 11(5):271-84. [Medline]. Brenner RP, Schaul N. Periodic EEG patterns: classification, clinical correlation, and pathophysiology. J Clin Neurophysiol. 1990 Apr. 7(2):249-67. [Medline]. Husain AM, Mebust KA, Radtke RA. Generalized periodic epileptiform discharges: etiologies, relationship to status epilepticus, and prognosis. J Clin Neurophysiol. 1999 Jan. 16(1):51-8. [Medline]. Kellaway P. The electroencephalographic features of benign centrotemporal (rolandic) epilepsy of childhood. Epilepsia. 2000 Aug. 41(8):1053-6. [Medline]. Reeves AL, Klass DW. Frequency asymmetry of sleep spindles associated with focal pathology. Electroencephalogr Clin Neurophysiol. 1998 Jan. 106(1):84-6. [Medline]. San-Juan OD, Chiappa KH, Costello DJ, Cole AJ. Periodic epileptiform discharges in hypoxic encephalopathy: BiPLEDs and GPEDs as a poor prognosis for survival. Seizure. 2009 Jun. 18(5):365-8. [Medline]. Schaul N, Green L, Peyster R, Gotman J. Structural determinants of electroencephalographic findings in acute hemispheric lesions. Ann Neurol. 1986 Dec. 20(6):703-11. [Medline]. 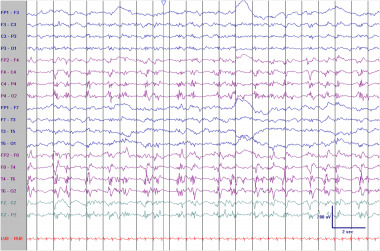 Schraeder PL, Singh N. Seizure disorders following periodic lateralized epileptiform discharges. Epilepsia. 1980 Dec. 21(6):647-53. [Medline]. Terzano MG, Parrino L, Mazzucchi A, Moretti G. Confusional states with periodic lateralized epileptiform discharges (PLEDs): a peculiar epileptic syndrome in the elderly. Epilepsia. 1986 Jul-Aug. 27(4):446-57. [Medline]. Westmoreland BF, Klass DW, Sharbrough FW. Chronic periodic lateralized epileptiform discharges. Arch Neurol. 1986 May. 43(5):494-6. [Medline]. Worrell GA, Lagerlund TD, Buchhalter JR. Role and limitations of routine and ambulatory scalp electroencephalography in diagnosing and managing seizures. Mayo Clin Proc. 2002 Sep. 77(9):991-8. [Medline]. 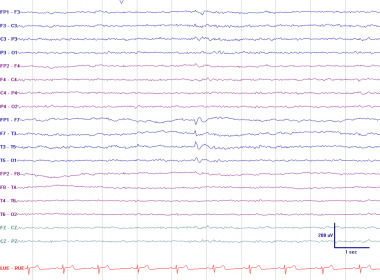 Posterior slow waves of youth punctuate the posterior rhythm in this normal EEG recorded from a 9-year-old girl. They might be mistaken for occipital spikes or slow waves. Posterior slow waves of youth invariably share the same distribution and reactivity as the alpha rhythm. Persistence of the transient with eye opening or into drowsiness, when the alpha rhythm attenuates, would suggest an abnormality. 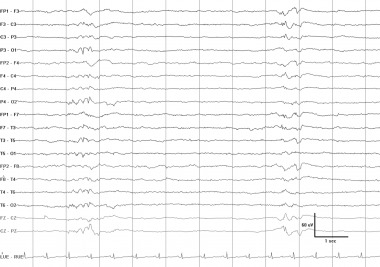 Positive occipital sharp transients of sleep (POSTS) are present in this normal EEG, recorded from a 13-year-old girl in sleep. These bisynchronous discharges occur in brief runs at 4-5 Hz. POSTS also occur unilaterally and as isolated discharges. They first occur in stage 1 sleep and may persist into slow wave sleep. The authors and editors of Medscape Reference gratefully acknowledge the contributions of previous author Joseph F Hulihan, MD to the development and writing of this article.